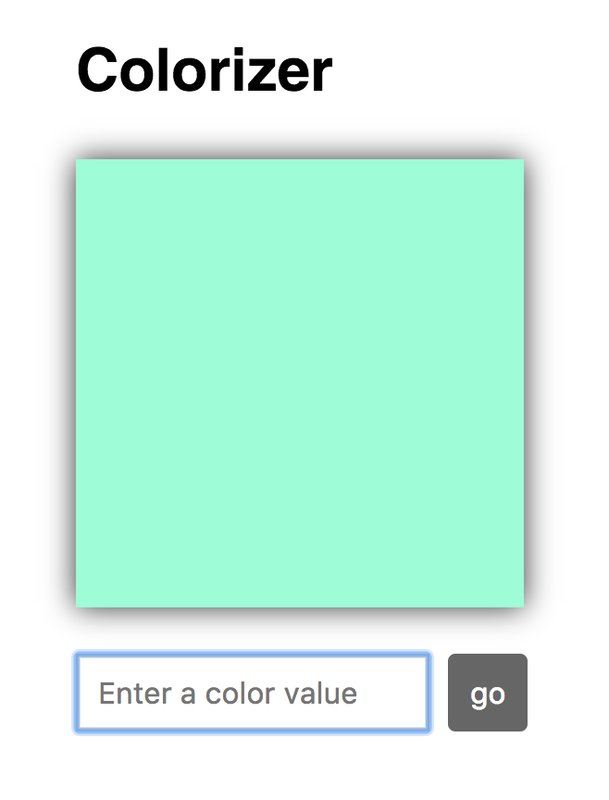 That the square changes color for any valid color value you submit is pretty awesome, but it isn't what I want you to focus on. Instead, pay attention to the text field and the button after you submit a value. Notice that the button gets focus, and the color value you just submitted is still displayed inside the form. If you want to enter another color value, you need to explicitly return focus to the text field and clear out whatever current value is present. Eww! That seems unnecessary, and we can do better than that from a usability point of view! 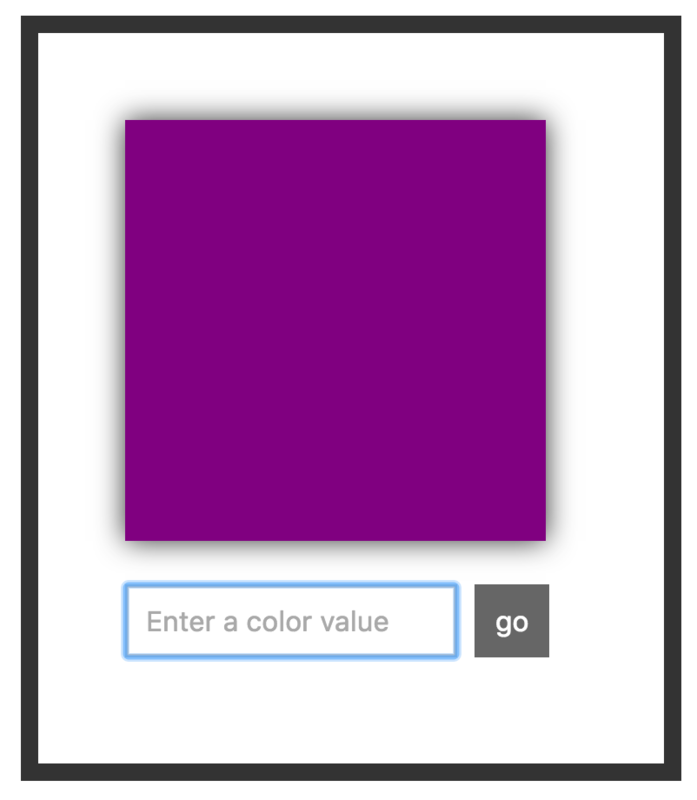 The entered value of purple is cleared, and the focus is returned to the text field. 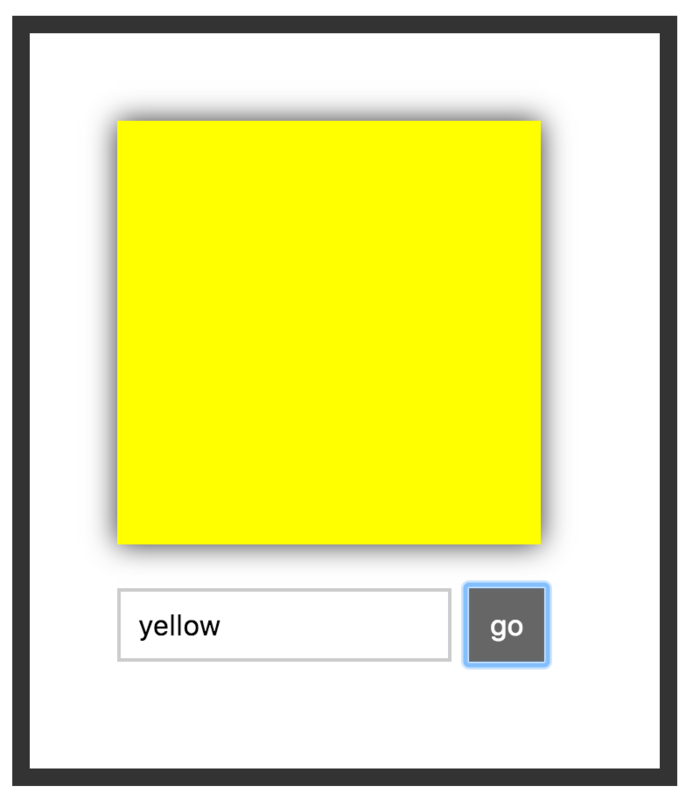 This allows us to enter additional color values and submit them easily without having to keep jumping focus back and forth between the text field and the button. Isn't that much nicer? OMG! A React Book Written by Kirupa?!! To kick your React skills up a few notches, everything you see here and more (with all its casual clarity!) is available in both paperback and digital editions. Take a few moments to look through the code and see how it maps to what our example works. There shouldn't be anything surprising here. Once you've gotten a good understanding of this code, it's time for us to first learn about refs. As you know very well by now, inside our various render methods, we've been writing HTML-like things known as JSX. Our JSX is simply a description of what the DOM should look like. It doesn't represent actual HTML...despite looking a whole lot like it. Anyway, to provide a bridge between JSX and the final HTML elements in the DOM, React provides us with something funnily named known as refs (short for references). The end result of this code running once our component mounts is simple: we can access the HTML representing our input element from anywhere inside our component by using self._input. Take a few moments to see how the highlighted lines of code help do that. Once you are done, we'll walk through this code together. This anonymous function gets called when our component mounts, and a reference to the final HTML DOM element is passed in as an argument. We capture this argument using the el identifier, but you can use any name for this argument that you want. The body of this callback function simply sets a custom property called _input to the value of our DOM element. To ensure we create this property on our component, we use the self variable to create a closure where the this in question refers to our component as opposed to the callback function itself. Phew! 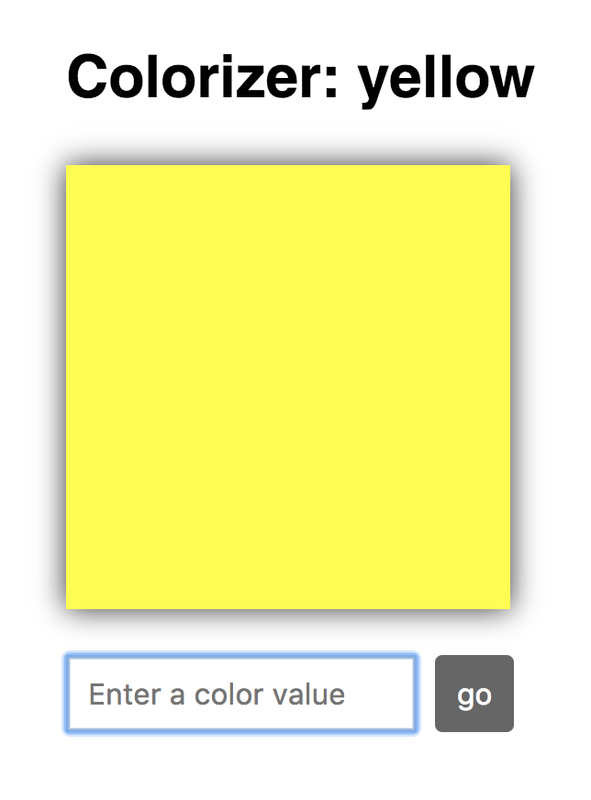 By calling this._input.value = "", we clear the color you entered. We set focus back to our input element by calling this._input.focus(). All of our ref related work was to simply enable these two lines where we needed some way to have this._input point to the HTML element representing our input element that we defined in JSX. Once we figured that out, we just call the value property and focus method the DOM API exposes on this element. Learning React is hard enough, so I have tried to shy away from forcing you to use ES6 techniques by default. When it comes to working with the ref attribute, using arrow functions to deal with the callback function does simplify matters a bit. This is one of those cases where I recommend you use an ES6 technique. To deal with context shenanigans, we created a self variable initialized to this to ensure we created the _input property on our component. That seems unnecessarily messy. The end result is identical to what we spent all of this time looking at, and because of how arrow functions deal with context, you can use this inside the function body and reference the component without doing any extra work. No need for an outer self variable equivalent! There is one more DOM-related trick that you need to be aware of. So far, we've only been dealing with HTML in the context of what our JSX generates - either from a single component or combined through many components. This means we are limited by the DOM hierarchy our parent components impose on us. Having arbitrary access to any DOM element anywhere on the page doesn't seem like something we can do. Or can we? Well...as it turns out, you can! You can choose to render your JSX to any DOM element anywhere on the page. You aren't limited to just sending your JSX to a parent component! The magic behind this wizardry is a feature known as portals. Here is what we want to do. We want change the value of our h1 element to display the name of the color we are currently previewing. The point to emphasize is that our h1 element is a sibling of our container div element where our app is set to render into. The important part to re-emphasize is that our h1 element is outside the scope of our main React app which prints to our container div element. By relying on portals, we have direct access to any element in our page's DOM and can render content into it - bypassing the traditional parent/child hierarchy we've been living under so far! Most of the time, everything you want to do will be within arm's reach of the JSX you are writing. There will be times when you need to break free from the box React puts you in. Even though everything we are creating is rendering to a HTML document, our React app is like a self-sufficient tropical island within the document where you never quite see the actual HTML that is just beneath the sands. To help you both see the HTML inside the island and make contact with things that live outside of the island, we looked at two features, refs and portals. Refs allow you to cut through and access the underlying HTML element behind the JSX. Portals allow you to render your content to any element in the DOM you have access to. Between these two solutions, you should be able to easily address any need that you may have to deal with the DOM directly!